Saving money while traveling in style is always a plus so we’ve compiled a list of 10 top places across the U.S. to visit and redeem Hilton HHonors Points this holiday season. The city so nice they named it twice, New York City reigned in an estimated 58.3 million travelers in 2015 alone with winter being one of the most popular—and best—times to visit. Winter is the prime time for the big-city-lover who also enjoys some of the most glamorous holiday decorations and Christmas trees in the world. While Times Square, 5th Avenue and Rockefeller Center may seem like New York’s main highlights, the city is also filled with natural beauty. In fact, 14 percent of the city is park land – think both icon green spaces like Central Park and Prospect Park, along with lesser known parks like local community gardens and more that are more beautiful when sprinkled with snow. Situated in the heart of Manhattan, Times Square is within easy reach of all of New York’s main attractions, including 30 Rock, Radio City Music Hall, the Empire State Building, the MoMA, and the popular restaurant and bar scenes of Restaurant Row. 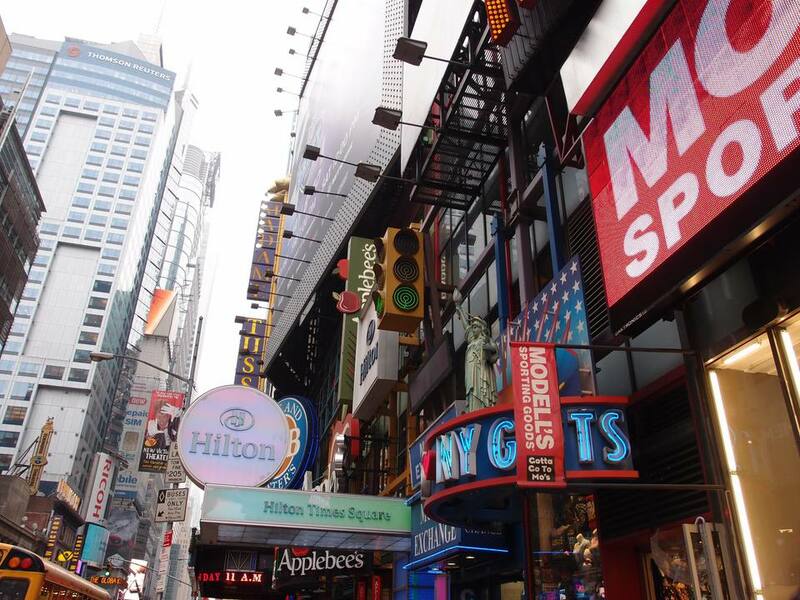 With Hilton Times Square’s bustling location and convenience to the subway, it’s a great starting off point to fully experience everything New York has to offer. For more warm-blooded travelers, winter is one of the best times to visit Florida because it doesn’t get lower than the 50’s! While in Florida, what better activities are there than hopping from theme park to theme park – especially when the lines are the shortest of the entire year? Lucky for you, Lake Buena Vista is home to the world’s most popular theme park: Walt Disney World. Recognized as the most popular family-fun spot, the milder temperatures of November and December make Lake Buena Vista ideal for family fun and those who seek adventure. The newly redesigned Embassy Suites by Hilton Orlando Lake Buena Vista Resort houses amenities for everyone in the family. From fire-pits to spa treatment rooms to putting greens and pools, your family will have a hard time wanting to leave the resort to head to the parks. With free cooked-to-order breakfast every day of the week, all members of the family will be energized to bounce from Magic Kingdom to Animal Kingdom in the blink of an eye. A city known for its renowned arch, St. Louis is rapidly emerging as one of the nation’s hottest travel destinations and cultural hubs. With local attractions from the Peabody Opera House to Busch Stadium, St. Louis is filled with hotspots to explore. And from historical sites like Grant’s Farm, Samuel Cupples House and the Chatillon-Demenil Mansion to modern marvels such as the Missouri Botanical Gardens, Cathedra Basilica and Gateway Arch—the city has something for all travelers. A popular attraction since the 1950s, Steinberg Rink offers visitors access to the largest outdoor ice skating rink in the Midwest. Night skating is the most popular with breaks by the fire pits nearby. Once the historical St. Louis Union Station, the AAA Four Diamond Hotel is in the heart of a lively metropolitan area. St. Louis Union Station Hotel mixes the city’s past and present for a unique stay with timeless décor and lavish ambiance. And located in the heart of St. Louis, the hotel offers prime access to public transit so it is impossible to avoid any of the wonderful sights. For those not quite ready to leave summer’s sunny days behind, Miami is the perfect winter getaway. With a warm winter and chic beach vibe, Miami is the essential retreat from the snow and early sunsets found up north. A city known for its crystal clear waters and eccentric nightlife, Miami is a one-stop shop guaranteeing all visitors a fun and relaxing tropical holiday destination. Conrad Miami is the perfect landing spot for a visit to The Magic City. The hotel is set within the heart of the city and just a few steps from the beach, popular nightlife and world-renowned upscale dining. This hotel offers unique extras to all guests like a serene rooftop pool, modern rooms with ample work space and a spa with express services for people on the go. Also, every day, Hilton HHonors members get to experience a special cocktail reception catered just for them. Art, history, culture and snow for days, Minneapolis is a winter wonderland during the holidays. Situated adjacent to the state capital, St. Paul, Minneapolis boasts some of the best culture, arts and dining in all of Minnesota. The city’s beautiful ambiance and numerous areas to play in the snow make it a great city to visit in the winter. Minneapolis has become a prime location to travel to before the holidays thanks to the Saint Paul Winter Carnival—the nation’s oldest and largest winter festival. Carnival events include parades, cultural celebrations, a giant snow slide, and ice and snow sculpture contests from January 26 through February 5. Located in the heart of the downtown Minneapolis, Hampton Inn & Suites Minneapolis/Downtown is just steps away from museums, sports centers and the legendary Mall of America. Situated near the Mississippi River, a short stroll takes you to the Mill District—a historical area of the city featuring fine dining, gorgeous parks and striking views of Saint Anthony Falls. Nicknamed the “Big Easy,” a city notorious for its around-the-clock nightlife, vibrant live-music scene, spicy cuisine and the home of jazz and blues, New Orleans is the U.S.’s own melting pot of French, African and American cultures. Located on the Mississippi River, near the Gulf of Mexico, New Orleans is one of the most popular travel hotspots—especially in late-winter for its festive Mardi Gras carnival. From the raucous of the festival to the beauty of the old south in the French Quarter, New Orleans has something to offer to any and all visitors. Nestled in the heart of New Orleans’ French Quarter, The Roosevelt New Orleans offers plush rooms and suites just one block from Bourbon Street—the city’s well-known and frequently visited strip of bars and restaurants. The Roosevelt also houses a full-service spa to offer a retreat from the bustle of the city. If visiting during the holidays, guests have the opportunity to experience the resort’s popular, luxurious Fountain Lounge with exclusive cocktails and menus catered to the season. As the temperatures continue to cool and the tourists dwindle, Denver—affectionately known as the Mile-High City—becomes an even more attractive getaway for the winter. While nature lovers can view the brilliant ski slopes in neighboring towns, city lovers can experience the hustle and bustle of Colorado’s popular capital. The Denver Art Museum along with the city’s eclectic dining options cement the city as a favorite among visitors. Within walking distance of some of the best local sights, The Curtis – A DoubleTree by Hilton offers a great location in the vibrant city of Denver. Whether shopping at 16th Street Mall or catching a Colorado Avalanche game at Pepsi Center, the hotel is in the center of it all. Looking to explore the local food scene? Not a problem. The hotel is situated right in the heart of Denver’s foodie paradise. Do you want to hit the links in pleasantly warm temperatures this holiday season? If you answered yes, then Scottsdale is for you. Known for its spa resorts and golf courses, Scottsdale is a popular and affordable city to travel to—especially in the holiday season. The mild winters Scottsdale enjoys leave all warm weather seekers with a perfect retreat away from the cold. With parks and recreation as far as the eye can see, visitors can never get enough fresh air and scenic views. Within walking distance of some of the best local sights, The Boulders Resort & Spa – Curio, a Collection by Hilton offers a great location in the vibrant town of Scottsdale. Visitors have full access to world-class service, a tranquil spa and two golf courses—as if one isn’t enough. The resort, situated in the beautiful Sonoran Desert, provides a desert hideaway with a serene atmosphere allowing guests to relax from the moment they check in. What is the best way to warm up following a day in the Windy City? Deep-dish pizza, of course. Chicago, a city known for its beautiful – yet rather chilly—winters, is one of the most traveled-to cities in the U.S. Maybe it is the city’s art and culture everywhere you turn—with the Bean and the Museum of Contemporary Art—or the city’s reputability in regards to its prime dining options that make it such a travel must. Regardless of the reason, the city is lights up with decorations and comes alive with celebration at the many holiday markets during the winter holiday season. A great way to see Chicago is by staying at Waldorf Astoria Chicago in the heart of the city’s Gold Coast neighborhood. The luxe high-rise offers spectacular views of Lake Michigan and is a short walk to all the best sightseeing places, such as Millennium Park. Imagine ending a chilly day in the resort’s European-style bistro or at the on-property spa and steam rooms. San Diego’s beaches, parks and warm climate make it the perfect winter escape for anyone looking to enjoy a California-holiday season. San Diego is a sophisticated city filled with unique architecture, numerous art galleries and fashionable locals. Among the city’s must-see cultural attractions include the San Diego Zoo, the harbor, Balboa Park and the many gardens that make San Diego one of the most beautiful cities in California. Situated within the tranquil Torrey Pines area, Hilton Garden Inn San Diego Del Mar is conveniently located to popular San Diego attractions, including Torrey Pines Golf Course, Del Mar Fairgrounds, Del Mar Plaza and UCSD. Also home to the popular Bistro 39 Restaurant and Lounge, the hotel’s location gives visitors access to experience the city’s local culture, beautiful weather and countless attractions. To learn more about Hilton HHonors, join the program and view the more than 4,700 hotels around the world where Points can be redeemed at visit HHonors.com.